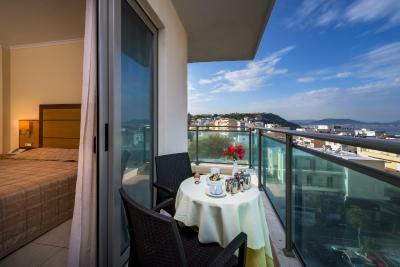 Lock in a great price for Manousos City Hotel – rated 8.2 by recent guests! Warm expectant welcome at late night arrival. Given a choice of rooms when I asked for one with partial sea view. Hotel is about a block from the sea for walks. Ample choice for breakfast that allowed me variety over a one week stay. Being allowed to use tables in the quiet lounge as my informal office for working during the afternoons. Cheerful help whenever needed from front-desk staff, breakfast chef, technicians, cleaners, etc. Special mention should be made of Christina who was a great host, giving good advice on tourism activities and providing assistance promptly on miscellaneous matters. Everything was fine. Good breakfast and good location. True to pictures attached. Comfortable, clean and at the good location. Buffet breakfast was very nice. Would book again. Very nice clean hotel. Friendly staff, great location. 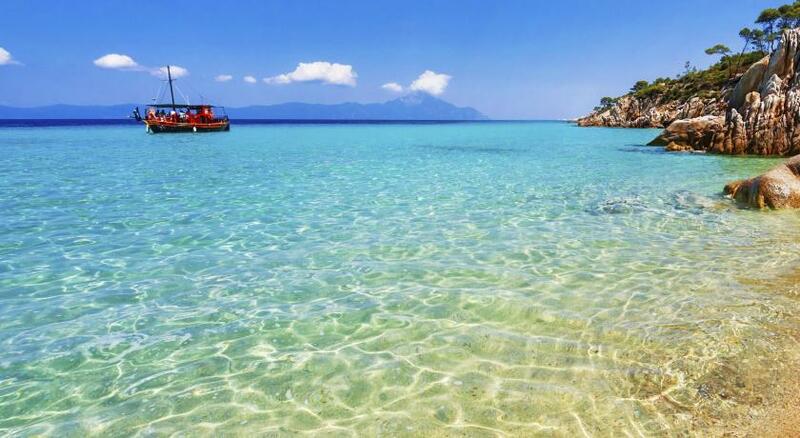 Good location, close to the sea and touristic area. Nice hotel, comfy beds, very good A/C and bathroom with a bath! Amazing staff! Superb location, friendly staff, very clean room with nice balcony and delicious breakfast!!! Good value for the money!!! It is right next to the beach, close to the city center. Walkable distance from bus stop so you can get anywhere from it. everybody working fo manousos hotel does a great job! helpful and willing to adjust to all needs, like when we asked for a late check out or some extra time at the breakfast lounge! 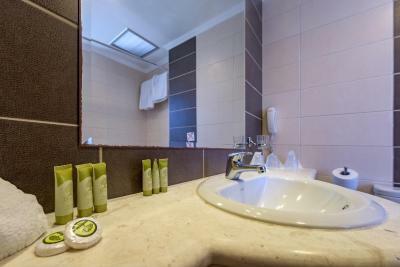 Manousos City Hotel This rating is a reflection of how the property compares to the industry standard when it comes to price, facilities and services available. It's based on a self-evaluation by the property. Use this rating to help choose your stay! This central hotel offers comfortable accommodations and a friendly atmosphere, within walking distance of Rhodes' main attractions. 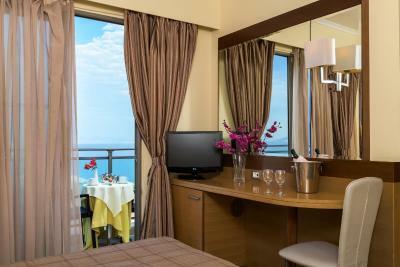 The rooms at Manousos City Hotel are tastefully decorated and well-furnished with air conditioning and satellite TV. All rooms offer free Wi-Fi access. A buffet breakfast is included in the room price and a half-board service is also available. Manousos City Hotel also has an outdoor swimming pool and 24-hour front desk. The beach is just 300 feet from Manousos City Hotel and there are plenty of bars around the corner. The medieval Rhodes Town is at half a mile and Rhodes International Airport is 9 miles away. When would you like to stay at Manousos City Hotel? Features free Wi-Fi, a satellite TV, air conditioning and safe. Includes a private bathroom with hairdryer. 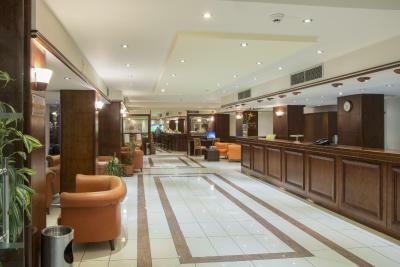 Features free WiFi, satellite TV, air conditioning and safety deposit box. Includes a private bathroom with hairdryer. Please note that a child up to 6 years old will be accommodated in an extra bed. Kindly note that this room type can exclusively accommodate 3 guests, thus an additional extra bed cannot be provided. House Rules Manousos City Hotel takes special requests – add in the next step! Manousos City Hotel accepts these cards and reserves the right to temporarily hold an amount prior to arrival. Very lImited English language television channels (essentially only CNN) due to poor reception of others, and rather blurry vision for those available despite a new cable installed on complaint - maybe due to weather affecting the satellite reception. A brighter lamp over 'desk-ledge' in room would have made reading easier. Wish the glass I used for drinks in room was rinsed out each day. Having some coffee-making facility available in room would be wonderful. Good location,friendly staff,clean room,comfy beds and excellant breakfast.Will definitely stay again. Very nice breakfast. Rich and tasty variety. Nice location. Easy access to beach and center. We booked room with 2 single beds. They got us a double room that could separate the beds but rather improvised. It was ok though. It's a great place to stay in when you are in Rhodes. The reception is great specially Fotini i. Very kind and helpful. Breakfast was really good and the products had really good quality. We enjoyed it! The stuff was very polite and helpful. The room was comfortable. There should be slippers and kettle in the room. Also, our room didn't have ''don't disturb'' sign as well. There is no parking area which is very hard to find near. Breakfast was quite good. Staffs are helpful. Location is OK as well. There are few good restaurants very close. Rooms are clean. We got placed over the road not in the main building, which i request a room at the back of the main building and was expect that. but the room we had was good and what you would expect. Well appointed rooms and special request noted in the booking. Very friendly staff all over the hotel. A special thank you to the head waiter Irini, extremely serviceminded and ready to cater to your wish. The Hotel is a 3 Star and was fine unfortunately we went there from the Plaza whicj although was of course better it eas twice as expensive. So all in all fine ..Staff very good.. They have charged my credit card as prepayment what they were not allowed to by terms of reservation. I'm not Euro-zone resident, so actually I was charged more as the bank's exchange rate is riddiculous. On my complaint I've received rude and arrogant answer 'We ofen do this and we have no complains.' No apologies, not to mention the cover of my loss. Some windows face "party" street, so somtimes it's noisy at night. The staff are very kind and helpful. Excellent breakfast.